More and more woodworkers are choosing traditional methods of finishing rather than quick fix solutions that don’t age well. Shellac is an ancient finish that gives a lustrous depth to timber and works well on both contemporary and traditional furniture. The U-Beaut range of finishes are based on traditional French polishing products. Their shellac can be used for everything from a sanding sealer to a high gloss fully French Polished finish. The Hard Shellac even solves the problems of susceptibility to heat and water damage. A good finish can be achieved by sanding with 400 grit – 600 grit sandpaper. It is essential to work your way gradually up through the grades of sandpaper, for example; 180 grit, 220 grit, 280 grit, 320 grit, 400 grit and so on. This reduces the chance of coarser scratches being left behind. I usually use aluminium oxide sandpaper in the lower grades and switch to wet and dry from 400 grit onwards (I use this dry). Take lots of care to remove any swirls from power sanders, they can often become obvious when you start to apply your finish. No matter what your choice of finish is, it’s a good idea to “wet down” your workpiece after fine sanding. When you apply a stain or finish to your prepared surface, it will always raise the grain, requiring you to sand quite heavily between coats. To avoid this, wipe the surface with a damp sponge (not too wet), then let it dry and sand it back with 400 grit or finer sandpaper, then repeat the process. When you apply your first coat of stain or finish the grain will stay relatively flat and sealed. You will still need to sand it back lightly between coats but to a much lesser extent. Wetting down is great for reducing patchiness when applying stain. Shellac has an intriguing history and interesting origins that could be the subject of a whole article in itself. It is a resin that is secreted by the lac beetle onto the small branches of trees found in parts of Thailand and India. The resin is harvested by breaking the twigs and removing the resin with rollers. After soaking in water and grinding, it is placed in a cotton bag. It is then heated over a fire and melted. The resin seeps through the cotton leaving behind the bits of bark and beetle. The shellac is dried into sheet form and then broken up into flakes. Sometimes it is dried into larger blobs known as “buttons”. 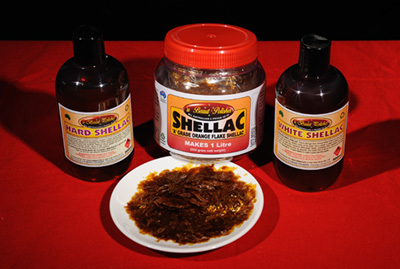 Shellac in flake form should be mixed with industrial grade methylated spirits that you can purchase from hardware stores or paint shops, household varieties contain water and degrade the polish. White shellac is shellac that is dewaxed and bleached to give a much clearer finish. This is often used on blonde timbers. The very best way to apply shellac is with a French polisher’s “rubber” or “mouse”, so-called because of its point at the front and round end. This is a piece of cotton wadding with a piece of cotton cloth wrapped around it, the wadding is the reservoir that holds the shellac. The flow is controlled by applying more or less pressure to the twisted cotton at the back. I find this such an effective method of applying a finish that I use for stain and oils as well. If your using The U-Beaut Hard Shellac mix, it can be used directly from the bottle. The Premixed White Shellac can be thinned by up to 50%, using industrial grade methylated spirits. Pour a small amount into a plastic or glass container and add about half as much again, then test the mix. Experiment a little until you’re happy with the consistency. Its better if it’s not too thin you want a thin film to flow from your rubber. If it’s too thick it will be a bit sticky and won’t go on smoothly. Stir the mix slowly, don’t shake it, you don’t want air bubbles to form. If you’re mixing shellac flakes mix one litre of industrial grade methylated spirits to every 220 grams of flakes. The U-Beaut flakes come in a one-litre jar that you can use for your mix. If you only need a small amount, don’t mix too much more than what you need, it will keep a long time in flake form if stored in a cool dry place. You can reduce your proportions accordingly i.e; 110 grams to 500 ml of methylated spirits. After the flakes have been mixed it’s best to strain the liquid through an old stocking to catch any impurities such as any pieces of sticks or cloth, it comes into the country in Hessian sacks so it’s not unusual to find fibres amongst the flakes. 1. You will need a small square of soft cotton cloth without texture or ribs and a piece of raw cotton wadding, this acts as the ‘reservoir’ for the liquid. Cotton wool isn’t a good substitute because it compresses too much when it’s wet and the shellac won’t flow as well as the more unprocessed fibre, it also doesn’t last as long. 2. Form a pear shape with the cotton wadding, the ‘pointy’ end is for getting into small areas. 3. Fold over the cotton at the pointy end and continue to tuck the sides in along the length of the pad. When you get to the end twist the remainder of the cotton so it forms a ball in the palm of your hand. 4. The pad is always ‘charged’ by opening the fabric and filling the cotton wadding from the back. This is not ‘true’ French Polishing, but it is a much- simplified version that I have gotten very good results with. It will give you the feel of the product and if you like using shellac you can go further into the traditional techniques as outlined in Neil Ellis’, ‘A Polisher’s Handbook’ (available in-store or via phone orders). To begin polishing charge the pad and gently squeeze it through until you see it seep through the face of the pad, the flow of material is controlled by the amount of pressure you apply to the back. If you want to use the shellac as a sealer about one to two coats is enough to fill up the grain, after rubbing back you can then proceed with your wax or oil topcoats. If you want a fuller finish with shellac you will need to continue building your coats until you achieve some ‘depth’. After about six coats it is less necessary to sand between coats because you start to work and ‘pull up’ the body of polish that is already there. Allow time for the layers to dry and leave it overnight before you work it too much further. You may notice that your rubber begins to drag a little, if you put a couple of drops of raw linseed oil or paraffin oil on the base it will lubricate it and make it work more smoothly. I have even used olive oil for this purpose. Don’t use too much or it will become streaky. At this stage you want a very small amount of shellac in you rubber, the dryer pad will create some friction and burnish a real shine in your finish. Be aware too much friction can result in you ‘burning’ the surface and damaging the layers. When you have achieved the level of depth you want, you can either leave it as it is or leave it overnight again before polishing finally with wax. Apply the wax with 0000 steel wool and then polish with a soft cloth. Never use steel wool on bare timber as it can get into the fibres and rust causing pockets of discolouration. The steel wool will give a softer patina and take off the ‘candy apple’ gloss. Your finish should feel smooth and silky and have warm glow. If there are carving or small details in your work, I suggest you use a French Polisher’s Mop to apply the initial coats of shellac, once you build a body of material you can then work the surface with your rubber. Mops are very fine brushes with a particular shape that fans out when you use them. They were traditionally made of squirrel hair, but these are very expensive. They are now available in a blended mix of soft natural hair for a lot less. Don’t ever let your rubber or mop dry out, always keep the rubber in an airtight jar, it will last over several projects often getting better with use. Suspend your mop in a jar of methylated spirits by winding some wire around the handle and resting it on the rim of the jar, don’t let it rest on the bristles as this will distort the shape. Using shellac takes some practice, but once you start seeing your work glowing with depth and warmth, I’m sure you’ll find it well worth the effort. Happy polishing and remember that if you mess the whole thing up, shellac is easily removed with methylated spirits. Sometimes failure is the very best way to learn.